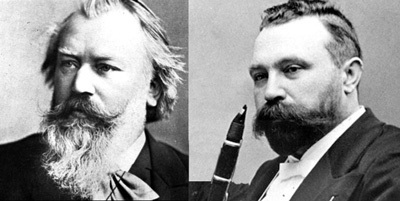 Music: Johannes Brahms including his two clarinet sonatas, clarinet trio and clarinet quintet plus late solo piano works. Artists: World renowned pianist André Watts, clarinetist David Shifrin, and the Miró Quartet. Nearing his sixtieth birthday Brahms announces he’s done composing, time to relax, take it easy. In a chance encounter, meeting and hearing clarinetist Mühlfeld, his contemplated retirement is shattered, and with renewed zeal he dispatches four seminal works for the instrument, and in so doing the composer simultaneously lays claim to this woodwind as a primary musical voice, and propels its proponent into the rarest musical firmament. This last muse, unanticipated, unassuming in manner, is nonetheless destined to enter Brahms’ most select company of Robert and Clara Schumann, violinist Joseph Joachim, kindred spirits all. Recollecting that fateful first meeting and his eventual ordination into the composer’s inner sanctum, our storyteller never misses the tale’s fundamental truth of the unlikely, felicitous confluence of creator and muse—the indelible creations left us—to enjoy, to savor, to ponder, a last, and lasting testament.